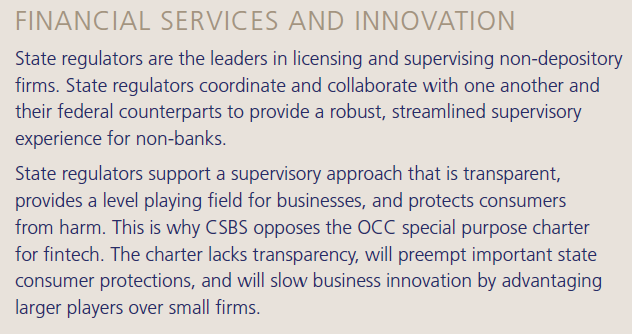 Statement from John W. Ryan, President and CEO, Conference of State Banking Supervisors (CSBS), in response to the Office of the Comptroller of the Currency (OCC) decision to move forward with creating national bank charters for financial technology companies and other non-banks, and begin considering applications. “It is deeply unsettling that the OCC chose to ignore the public record – including letters from Republicans and Democrats in Congress — warning of the harm this action will cause to consumers and the added risks to taxpayers. CSBS is exploring all options. We urge Congress to continue to weigh in on this important issue. CSBS submitted a detailed comment letter to the OCC in January, raising numerous concerns regarding a federal charter. The CSBS Fintech Industry Advisory Panel (“Advisory Panel”) is designed to support state regulators’ increased efforts to engage with financial services companies involved in fintech. A summarized list of the recommendations of the FIAP regarding changes to state bank supervision. Vision 2020 contains several CSBS and state initiatives to modernize nonbank regulation. What has been done to date, and what should you expect next? Vision 2020 is a state regulator initiative to modernize the regulation of fintech companies and other non-depositories. The goal: an integrated, 50-state system of licensing and supervision.